Heeriye by Reha Purohit is all about Ind-Bohemian wear that has mastered the fusion of comfort and fashion. A happy blend of organic Indian fabric and western styles, their collection cuts the usual clutter to stand out. An active participant at most exhibitions and festivals in the past, Reha has opened a permanent haunt in Khar. Her speciality lies in mixing batik and organic Indian fabrics with western styles to make comfortable and hip outfits. Their gipsy feeling outfits, are easy to carry for everyone; whether you're 16 or 60. One material they swear by is malmal (velvet), which makes everything you wear so soft, it’s as good as a part of your skin. They make ghararas, jumpsuits and standalone kurtas as well. You can pick the handwoven gharara with a little bit of gota-patti work, or a floor-length piece in pastel shades or even hand block printed maxis. Their collection starts at INR 2,500 for kurtas and goes up to INR 9,000 approx. for sharara and gharara sets. 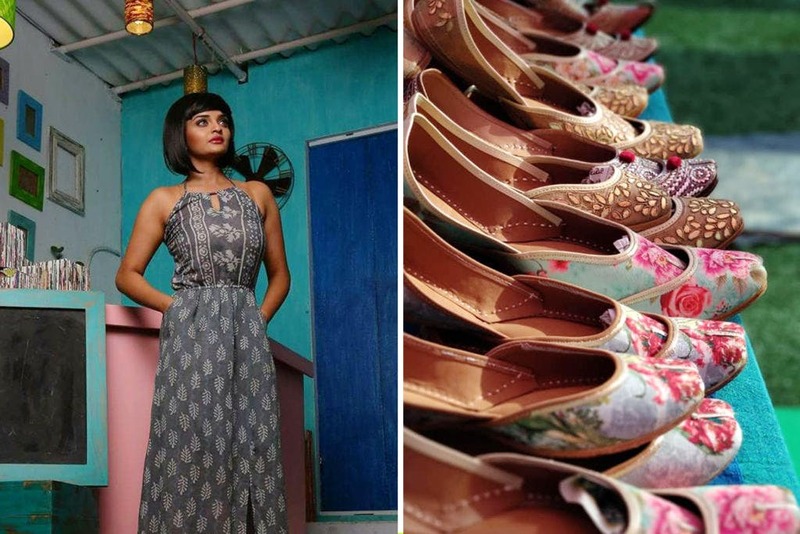 To match most of their collection, they also have juttis (INR 1,500) in pleasant prints with laces and borders that make it an all-rounder, fit to be worn for casual and formal outings alike. Their juttis are made with soft-padded soles that makes this footwear just as comfy as their clothing.To complete that look, you can also pick jewellery pieces from this store. To give you an idea, a kundan set – a bold neck piece with straight danglers – is priced at INR 3,500 and a kundan maang tika is available for INR 3,600 approx. Up your style quotient with Heeriye and add that dash of Indo-Bohemian outfits that are comfortable and trendy, fit for almost all kinds of events. Give them a call before visiting them, you might just get lucky and get to check out their latest collection at an exhibition happening near you!